In the years following the French Revolution of 1789, a large number of Frenchmen fled France and took refuge abroad. 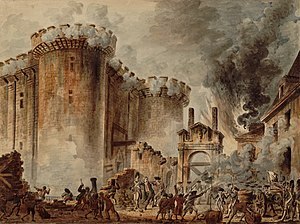 Nearly one percent of the French population abruptly left France, including many members of the royal family and the French aristocracy, as well as priests, clergymen and others who had lost lands and privileges during the great uprisings. While a large number of these émigrés gathered in Germany, Belgium, Switzerland, and in the United States, a significant number – particularly those from Normandy and north western France – found a safe haven in Great Britain. Though the British had nothing to gain politically from helping the Catholic French, Britain was, in fact, the only European nation to reach out to the émigrés with financial assistance. The French refugees found an established French-speaking community in England where the Huguenots had previously settled. Some made their homes in Richmond, Surrey, though the largest community of émigrés settled in London, where they found a strong social structure and an active political lobby. In 1796, England’s Alien’s Act was renewed, and all émigrés were moved inland from the coasts and Channel Island. By 1801, London’s West End and the Parish of St. Marylebone were populated with a substantial number of French political refugees. Aside from the 4,000 or so lay French Catholics, the area was home to some 5,600 priests and clergymen as well. Other French communities thrived in London as well. Some settled in Soho where the Huguenots had established a French community. Others made their homes along Tottenham Court Road, Thames Street, Aldgate, Cripplegate, Temple Bar, Bishopsgate, and Shoreditch. Others still settled in Somers Town near Old Pancras Church, which was a predominantly Catholic area and the traditional burial grounds for English Catholics. Of course, many members of the royal family and the aristocracy found a comfortable home in England as well. The comte d’Artois, the brother of Louis XVI, who would later become King Charles X spent the majority of the Revolutionary War and the Napoleonic years in England. Louis-Philippe, the duc d’Orleans (who would later become King Louis-Philippe) also took refuge in England after spending a number of years in Scandinavia and the United States. A few émigrés were lucky enough to have English relatives who welcomed them into their homes. These were typically Stuart supporters who had followed James II to France. Many Walshes and Dillons, as well as the Duc and Duchesse de FitzJames numbered among the émigrés who fled to England at this time. A large number of émigrés were not so lucky, unfortunately. The poorest settled in St. George’s Fields, Southwark, and many fell ill and died. Though a significant number suffered gravely during this time, this fact is often overlooked due to the fact that the more prominent émigrés were wealthy members of the church or aristocracy. Some prominent Britons like the Duchess of York and John Eardley Wilmot worked tirelessly to raise awareness. Through their efforts, they provided a measure of relief for the suffering émigré population. Many working class émigrés were industrious, however, and established themselves fairly quickly. Some offered lessons in French, dancing, fencing, and chess. Others became tailors, seamstresses and hatmakers. Some opened boarding houses and restaurants. A number found work with the Post Office which gave them safe access to France where they were able to gather information. The émigrés left a mark on England in more ways than one. Chapels, hospitals and schools were constructed by these industrious immigrants – many of which still remain today. St. Cross in Dudley Court, Soho Square, was the first built, followed by others in Somers Town, St. George’s Fields, Tottenham, and St. Mareylebone. ALL Of My Ancestors Have Fought and Died To Save America From Communism! They Emigrated From Europe To Escape Communism, and To Have A Better Life! The 19th century saw increasingly hard times and harsh persecution for Jews throughout Eastern Europe. Many Jews had emigrated to Eastern Europe in medieval times. They lived for many years under Polish rule; however, when the kingdom of Poland was divided in the late 1700s, a huge percentage of the Jewish population suddenly found themselves under Russian rule. By the late 19th century, the Jewish people found conditions harsh and restrictive. They were confined to the Pale of Settlement, a section of western Russia between the Black Sea and the Baltic. Opportunities for employment were limited, as the Jews were only permitted to work in certain occupations. Most worked as artisans, tailors, metal workers, or carpenters. Many Jewish boys were forced into the Russian army, where they were required to serve for 25 years, facing a high risk of death and guaranteed brutality. The local population was hostile, actively barring Jewish children from public schools, and increasingly forcing Jews out of villages into smaller towns. In 1882, the May Laws were passed, which forced the Jews in the Pale of Settlement to live in only a few select towns. These towns were severely overcrowded, and the Jews had to compete fiercely for the few available jobs. Due to the intense competition, wages dropped far below the poverty line. Those not confined to towns fared little better, scratching out a meager existence on tiny farms. Because they were so pressed, the Jews formed tightly-knit communities. They spoke Yiddish before learning Polish or Russian, and religious customs were strictly observed. Following the assassination of Tsar Alexander II in 1881, the persecution of Jews took on a new vengeance. A young Jewish woman was associated with the assassins, and this spurred the population on to violent attacks on Jews during the 1880s. Jews in Russia and throughout Eastern Europe lived in constant fear of violence, theft, and ever harsher restrictions. This spurred a mass emigration to freedom as the Jews sought to escape the dangers and persecution of Eastern Europe. Between 1881 and 1914, over 2 million Jews left Eastern Europe looking for a new home. Many, in fact, intended to go to America; however, upon arrival in England, over 120,000 Jews settled and stayed. Once again, Spitalfields drew an incoming population. The Jews were attracted by the opportunity for cheap living, and by 1900, a huge percentage of the Spitalfields population was Jewish. Unfortunately, the Jews did not receive the warm welcome that the Huguenots had enjoyed. Overcrowding was horrific as the beautiful Huguenot structures were subdivided to house the huge population. Sanitization was a nightmare, and living conditions (in many cases) were scarcely better than those the Jews had left behind. The huge Jewish immigration caused some friction amongst locals. The Jews were accused of taking local jobs and aggravating the already appalling working conditions present in many of the local businesses. Because the Jews were willing to accept overcrowded conditions, rents in the area shot up, further irritating the local population. Because of the unrest, the first Aliens Act was put into effect, restricting immigration into the country. Soon, however, the Jewish population began to thrive, making themselves a distinct and prominent presence in the East End. Their tight-knit communities allowed them to hold on to their cultural heritage, with Yiddish being predominantly used as a spoken and written language. The Jewish population developed into a vibrant community, centered in the East End. Small synagogues popped up throughout the community, providing a focal point for the Jewish population. Kosher butchers and food providers found huge success with acceptable foods being in high-demand. The Jewish Chronicle newspaper was widely read and Jewish trade unions flourished. In time, much of the Jewish population became integrated into London society. People spoke Yiddish less and less, religious rituals were less distinctive, and Jewish children were noted to be “almost indistinguishable” from English children. In time, the Jews too, moved away from Spitalfields. Unlike the Huguenots, the Jews left little to mark their time in the East End. Though the Jewish East End shows little of its history, the Jewish legacy and heritage has carried on to new generations throughout the UK.